New book, 48 pages, NVG207. 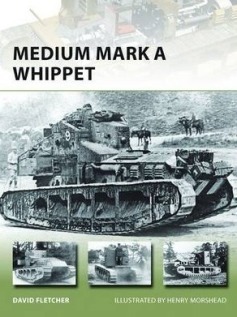 This title looks at the Medium Mark A Whippet, one of the most successful British tanks of World War I and, when placed alongside existing titles covering the Mark I, Mark IV and Mark V, completes the New Vanguard series' coverage of the major British tanks of the war. The evolution of the Whippet is examined in detail, from design and development to mechanical details and crew duties, and information on the operational use of the vehicle is drawn from war diaries and battalion records. The Whippet was involved in several well-known incidents that will be presented in this volume, including the clash at Cachy on April 24, 1918, the actions of the 6th Battalion tank known as "Musical Box" on August 8, 1918, and Sewell's Victoria Cross-winning exploits with the 3rd Battalion on August 29, 1918. Mention will also be made of the Whippet's involvement with the Tank Corps' expedition to Russia. In addition to this examination of the Mark A Whippet is a study of the other Medium tanks up to the end of the war: the Medium B, Medium C, Medium D and the experimental American Studebaker tank.